In a new article, (see link below) Amy Calladine argues that these rituals, which often took on a military character, were crucial in reconciling local elites – many of whom had been loyal to the Cromwellian Protectorate – to the new regime. Not only that, but the frequently martial nature of the ceremonies enabled those same elites to show their loyalty to the King. The military imagery employed in these rituals also aimed to dilute the threat of Commonwealth military power, partly by demonstrating the power of royalist gentry and their military resources. The ceremonies often included displays by the county militia, a part-time civilian defence force consisting of officers from the gentry and common militiamen from the respectable middling sort. 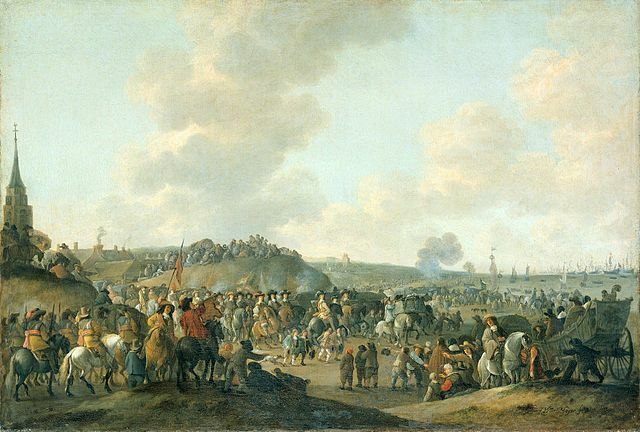 The return of the militia into the hands of the (royalist) gentry from March 1660 had been of critical importance in the public legitimization of the new settlement. The figure of the marching, celebrating militiaman also provided a helpful alternative to the threatening spectre of the demobilized parliamentary veteran. Equally, the participation of militia, volunteers and professional soldiers could be harnessed to provide a practical and symbolic defence of existing power structures. At Nottingham a play, Robin Hood and his Crew of Souldiers, placed the military at the centre of the Restoration by turning the famous outlaw into a formerly rebellious soldier now realising his loyal to the monarchy. In the play, set on the day of another coronation – that of Richard I – Robin quells the mutinous spirit of his merry men in order to swear loyalty to the new king. A messenger from the new regime promises the outlaws “pardon of all past misdemeanors” on condition of joining “forthwith” to “solemnize his happy Coronation” and offer “chearfull and ready submission to his Majesties Laws,” to which Robin and his men happily agree. The remade Robin Hood symbolized the ways in which the orderly participation of various military groups in Restoration rituals allowed the martial spirit of the period to be harnessed in order to tame the more problematic and ambiguous elements of the political settlement. Military ritual was designed to operate as both a demonstration of loyalty to the state and a confirmation of the well-governed civic community. In this way, the rituals of regime change contributed to a larger process of public legitimization.